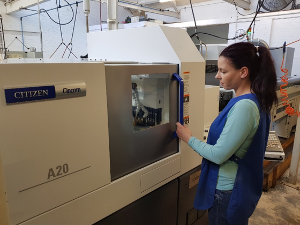 Colpa Precision Engineering has slashed weeks from its lead time with significantly reduced material costs plus the ability to obtain greater number of parts from a bar following the installation of a Citizen Cincom A20-VII with non-guide bush capability for use on plastics components. Colpa Precision Engineering was set up in 1946 having consistent investment with some £560,000 spent over the last three years with some six Citizen sliding head machines installed. On the Watford site, 10 people are employed and production batches vary between prototype and customer development parts to continuous production runs such as involving the supply of 32,000 parts a month. Colpa’s customer base covers a wide field including optical, electronic, audio, music, pneumatics, commercial air conditioning and certain aircraft industry companies producing parts from brass, mild and stainless steel, aluminium, titanium and a wide range of plastics including PEEK and acetal. Cycle times tend to generally vary between 45 secs and 2 mins. Mr Branch describes a typical multi-featured part produced on the new A20-VII, which is a multi-featured anti-skate dial machined in cycle times of under 2 minutes in batch quantities of 500. The anti-skate dial was transferred to the new machine from an existing A32 in order to free up its capacity for larger work and maximise the use of lower cost unground bar. The component is 14 mm diameter by 14.75 mm long with key features that include the head of the part with 12 milled slots each having 1 mm radius at the bottom of the slot set on a 15 mm tool PCD. A spigot diameter has a waist, the head undercut with a cross hole 1 mm diameter which breaks into the 2 mm through bore. The other end of the part has a cam form just 1 mm thick produced with a 4 mm radius and a 5.22 mm width cam lobe extended out to 4.75 mm and having blending radii of 1.5 mm. The part is also drilled and tapped M3 by 6.5 mm deep and the head counterbored to a series of 8.5, 10.5 and 12.5 mm diameters by 3.75, 3.0 and 1.75 mm respective depths. The 5-axis Cincom A20-VII has a bar capacity extendable to 25 mm with 10,000 revs/min main spindle from a 3.7 kW drive. The 1.5 kW sub-spindle has a maximum speed of 8,000 revs/min. The tool capacity is 21 tools with driven tools having a maximum speed of 6,000 revs/min from a 0.75 kW motor for cross machining. Positioning speed is fast at 32 m/min with a direct indexing C-axis enabling deceleration direct to the programmed position.